I found a recipe for sauteed fish recently that sounded so easy and delicious. It came in real handy this week, as I've started baby sitting with my granddaughter as of yesterday! Her momma had to go back to work, so I feel privileged to care for her. And since I haven't taken care of babies in such a long time, I thought this weeks meals had better be easy to prepare. The hardest part of this recipe is just cutting the cherry tomatoes in half and mincing the garlic and herbs! The tilapia took about 5 minutes to saute and the tomatoes much less than that, but this dish had great fresh flavor. The original recipe called for olives, but I didn't have any, so therefore I used lemon to add a nice tang. We loved it! In a large skillet over medium high heat, add 2 tablespoons of olive oil. Salt and pepper the fish fillets and lay in the skillet. Let them brown about 2 minutes, until they turn white around the edges. Carefully flip fish over with a spatula. Cook until the fish flakes, about another 2 minutes. This will depend on the thickness of the fish. Remove fish to a platter and keep warm. Add more oil to the skillet and add the minced garlic and the crushed red pepper. Stir until fragrant, but don't brown. Add the tomatoes and the herbs. Stir until heated through and then stir in the lemon juice. 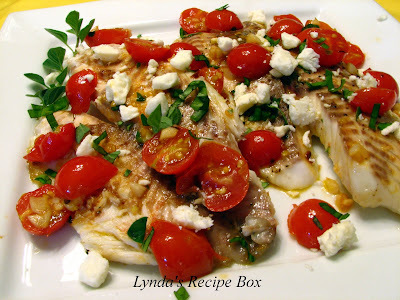 Pour over the fish and serve topped with Feta cheese. Enjoy this easy and flavorful dish. I will be making this one again! Delicious! I love the addition of spice and feta here! it's so bedecked with spices and tomatoes and cheese, i might not realize i'm eating fish before the entire serving is gone! I love tilapia!!! I really like all the flavors in the dish....sounds delicious and the feta is a special touch! What a great use for leftover feta! This is also a wonderful example of using your imagination to improvise a recipe. Who needs the exact ingredients? I'm going to feature this recipe next month on www.tilapiablog next month. Let me know if I can use your image! What a lovely, simple recipe. This looks absolutely delicious. I love the simpleness of this recipe. Tilapia is my hubs favorite fish- he will love this! This does sound delish! I really like Tilapia and those popping flavors must be delicious on top. YUM! We've been buying Tilapia quite a bit lately...for the longest time, all I really bought was salmon. I think my husband would love the "kick" to this dish! What a great grammy you are! this is a great recipe! That looks very delicious. Light and tasty, perfect for summer. Delicious, light meal! I love how quickly fish cooks, so I'm trying to incorporate it into our weeknights more often. The dish looks wonderful! I'm doing this. Love tilapia and the cherry tomatoes are fresh and it's still summer! And I want a summer meal! Gorgeous! Oh my goodness Lynda your posts make me so hungryI wanna eat everything in sight. This looks lovely, and it just so happens I have a whole bunch of cherry tomatoes fresh from the garden, so I'll be giving this one a whirl.